Four billion years ago, our planet was nothing like today. With a thin atmosphere and a crust barely formed, Earth was subjected to constant bombardments from meteors and asteroids and any water was boiled immediately. It was chaos, but Earth wasn’t alone. These were the early days of the solar system and elsewhere other planets were having a tough time. For instance, there’s this hypothesis that there was in fact an additional planet in the early solar system (at least one). This tentative “fifth gas giant” was supposedly ejected out of the solar system due to a gravitational tug of war between other planets. 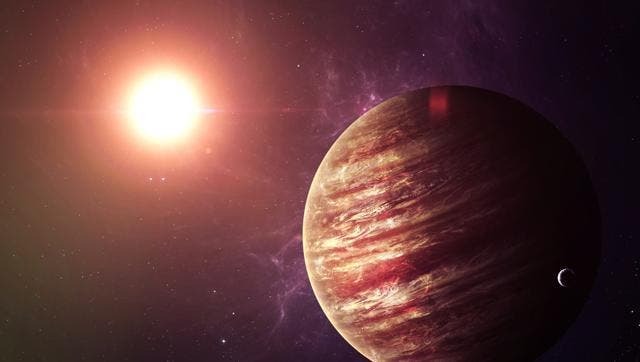 Now, a new study by researchers at the University of Toronto seems to suggest that Jupiter exerted the most influence over this planetary ejection. The idea was first suggested in 2011 by David Nesvorný of the Southwest Research Institute. By simulating the formation of the solar system, Nesvorný found that for the solar system to reach its current configuration, an additional Neptune-mass planet between Saturn and Uranus must have existed. Since this planet doesn’t exist anymore, the only feasible possibility is that it was ejected, and this isn’t as crazy at it sounds. If a planet encounters another much more massive planet, it could become accelerated to such a degree that it breaks free from the the massive gravitational pull of the Sun. “The possibility that the solar system had more than four giant planets initially, and ejected some, appears to be conceivable in view of the recent discovery of a large number of free-floating planets in interstellar space, indicating the planet ejection process could be a common occurrence,” Nesvorny said at the time. University of Toronto investigated this possibility by employing a forensic technique of sort. Namely, they studied the orbits of the gas giant satellites since such a violent encounter must have left a mark on these moons. They made computer simulations based on modern-day trajectories of Callisto and lapetus, the regular moons orbiting around Jupiter and Saturn respectively. They then measured the likelihood of each one producing its current orbit in the event that its host planet was responsible for ejecting the hypothetical planet, an incident which would have caused significant disturbance to each moon’s original orbit. Results show the event is 42% probable for Jupiter, while there is only 1% chance for Saturn.